Looking for the best rimfire scope? You’ve come to the right place! And we have something special for you, as we lined the best Rimfire scopes for you to look at. In our research, below is the Top 10 Best Rimfire Scopes in the market these days. These are all highly rated by users so you’ll be rest assured that anything from this list is a great product. The list is dominated by the Leupold brand – six out of 10 actually, including the top 6’s. All of which have been broadly described in our previous article here –> Leupold Rimfire Scopes – so please just check it out for all the Leupold entries in our list. CLICK HERE to go to Amazon and check out the Top 1 Rimfire Scope, the Leupold 113871 VX-1, for the latest price and any available DISCOUNT! Occupying 10th place is the Bushnell 613510A Rimfire Optics Scope with Multi-X Reticle, 3.5-10x36mm, Matte with 4.7 stars from six (6) users. This Bushnell Rimfire scope is designed to meet the specific requirements of .17 HMR and .22 rifles. Its banner optics are coated with Bushnell’s proprietary Dusk & Dawn Brightness (DDB) multi-coating process. This gives you the clarity and brightness even during the first and last minutes of daylight. It is very easy to fine-tune your sighting with the fast-focus eyepiece and the adjustable parallax. Windage and elevation can also be easily customized via the ¼” MOA fingertip adjustments on the turrets. This particular model utilizes a Multi-X reticle and features replaceable BDC turrets. The one-piece, 1” tube body is nitrogen-filled to make it 100% waterproof, fogproof and shockproof. Users are really pleased to find out that this scope is indeed a spot on for their A17 rifle with A17 ammo! 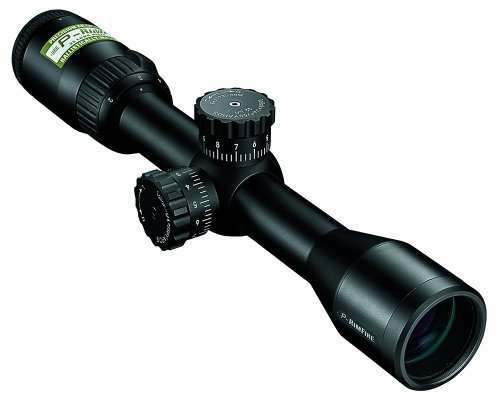 In 9th position is the Nikon P-RIMFIRE 2-7×32 Nikoplex Rifle Scope, Black with a star rating of 4.7 from 25 users. The P-Rimfire riflescope is a variation of Nikon’s precision optics for AR rifles. It is designed for really fast sighting speed and precision accuracy from rimfire AR platform and the .22 long rifle cartridge. This model utilizes the Nikoplex reticle in combination with Nikon’s Rapid Action Turret system which allows you to hold dead-on and simply adjust the elevation turret to the proper range. Field adjustment is as easy as 1-2-3. Take note that the extra turret is enclosed with a free hex wrench. With its 50-yard parallax setting, it also eliminates parallax for a more precise shooting. It is indeed suited for shooters who prefer to dial-in their shots at a known distance. It also offers a precise, 1/4-inch at 50-yard target-style hand-turn adjustments. With its generous and consistent eye relief of 3.8 inches, using this scope will be easy as well for those who wear glasses. The P-Rimfire has an excellent and clear optics which are made of Nikon Eco-Glass lenses, meaning they were manufactured without harmful elements like lead or arsenic. The lenses are also coated with multiple layers of anti-reflective compounds for better light transmission. The 1-inch nitrogen filled and O-ring sealed body is waterproof and fogproof. It is made of a rugged material that can withstand even heavy recoils. Lens or dust covers come supplied with the scope. This is a fantastic scope for S&W M&P AR-15/22’s and users are really happy for its super clear optics and with its nice, reliable & accurate adjustments. They also love being able to set zero and then dial in any range with great accuracy. This is really an amazing scope for the price and with its great features, you can never go wrong with the P-Rimfire from Nikon. Coming in at 8th place is the Vortex Crossfire II 2-7×32 Rifle Scope, V-Plex Rimfire Reticle, Rimfire CF2-31001R with a star rating of 4.7 from 29 users. Built with completely redesigned features and enhancements, the optics of the popular Vortex Crossfire is now even clearer and brighter. 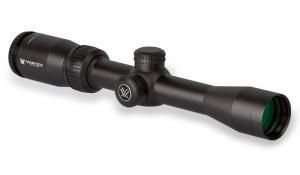 It is built with the intention of surpassing the performance standards of similarly-priced scopes. It is tougher than ever before with the single-piece tube constructed from a solid block of aircraft-grade aluminum material. The single-piece construction also maximizes alignment for improved accuracy and optimum visual performance, as well as ensures strength, rigidity and waterproofness. The lenses are all fully multi-coated with anti-reflective coating on all air-to-glass surfaces. This increases light transmission resulting in clear, crisp and bright images. The exterior lenses also have the proprietary ArmorTek Ultra-hard, scratch-resistant coating which protects them from scratches and other external elements like oil and dirt. The fast focus eyepiece allows for quick and easy reticle focusing. The scale of the V-Plex reticle maintains the same ideally-sized appearance and the listed reticle subtensions used for estimating range, holdover and wind drift correction are accurate at the highest magnification. The longer eye relief (3.9 inches) is also a welcome improvement as it is more user-friendly for eyeglass wearers. The improved and capped resettable MOA turrets ensure optimal performance in the field. It allows re-indexing of the turret to zero after sighting in the riflescope. The caps provide external protection for the turrets. The rugged tube has waterproof O-ring seals to prevent moisture, dust and debris from penetrating the riflescope and it is also nitrogen purged to prevent internal fogging. This makes for a really reliable and consistent performance in all environments. The Crossfire II is a great and perfect scope for the 10/22’s. The scope is clear, even on the highest magnification. Lowest magnification offers a good, and clear field of view. You can actually move your head all over the place and you’ll notice that the scope view never goes black. Users love that it holds zero, even after bumping it around. They also love the long eye relief feature, the nice fine reticle and the turrets. Great customer service and awesome product warranty are also some aspects that users of this scope are really thankful for. With a user rating of 4.7 stars from 65 users, the Nikon P-RIMFIRE BDC 150 Rifle Scope, Black is in our 7th position. This is essentially the same as our 9th ranked rifle scope from Nikon with the only difference being the reticle as this model uses a BDC 150 type. The BDC 150 reticle, which is designed for .22 LR ammunition shooting at 1,600 feet per second (fps), provides shooters unique open circle aiming points from fifty (50) to one hundred fifty (150) yards. The reticle is clear and the crosshair is very easy to see because the lines are thin. Users love the BDC 150 and mentioned that it is indeed spot on. The hold over circles perfectly coincided with 75, 100, 125 and 150 yards so it is really a handy feature for them. One other feature that users love is the audible and zero resetting turrets which can easily be adjusted. They said it is really high quality, they lock in well and return to zero easily. Take note though that the adjustments are for 50 yards and not the usual 100, so one click at 50 yards is 1/4″. Common application of this scope by users is for a Ruger 10/22 rifle. According to them it is a perfect combination. Users find it easy to zero and encounter no problems shooting at 100 yards with different types of ammunition with even a zoom setting of only 3. Some users find that this scope really gives plenty of eye-relief as well. With its bright, clear and crisp optics, repeatable adjustments, high quality craftsmanship and other convenient features, the Nikon P-Rimfire BDC 150 is indeed a great scope. Leupold rimfire scopes formed the Top 6 in our rankings list based on the most number of user reviews and high user rating. This is basically our ranking for the the best Leupold rimfire scopes that we have written previously in this article. Please refer to that for all the details and information on our Top 6 rimfire scopes. Leupold scopes are high-quality products with great features and excellent warranty. Feedbacks from users are really full of praises and wonderful things for this brand which is a testament to the products’ awesome performance in the field and general user satisfaction. As we mentioned though, we shall not discuss the features and specifications of each of the six (6) Leupold rimfire scopes here as we already have a comprehensive discussion of them in another article. At any rate, all we can say is that Leupold is a great brand and their rimfire scopes are the most popular for hunters. Check out the number 1 ranked Leupold Rimfire Scope here or click the button below. The table below summarizes the Top 10 best Rimfire scopes with some of their features and product ratings. There are two scopes which are rated 5 out of 5 stars (they are both Leupold models incidentally). The lightest is the Leupold FX-1 Rimfire 4×28 with only a weight of 7.5 ounces and it is also the shortest with only 9.2 inches total length. The Nikon P-Rimfire BDC 150 has the most number of user reviews with 65 and the one with the least is the Leupold VX-3 2.5-8×36 with 5. The Bushnell Rimfire 3.5-10×36 has the shortest eye relief, 3.4 inches. You can actually sort the table by clicking the arrows on the columns, and you’ll probably see some other interesting things that you can compare. Try it out! Our list of the Top 10 Best Rimfire Scopes were dominated by Leupold’s, having 6 out of 10 models in the ranking. We can technically say then, that as far as users are concerned, Leupold Rimfire scopes are the best and preferred by hunters and shooters. Next in rank would be the Nikon’s P-Rimfire series as there are two (2) models of them in our list and one of the models have in fact the most number of user reviews which means there are lots of people who bought them as well. With a user rating of 4.7, these models are actually not bad at all. Having said that, you can see that all the models in our Top 10 list have high user rating anyway so any model from this list is deemed to be a great product. Good luck and we shall see you on our next article.